I’m always worried about my son draining my iPhone battery with too much Angry Birds (or myself with too much Facebook and e-mail), so when I had the opportunity to test out a new battery case I jumped on it. On a busy day, I can drain my iPhone battery pretty quickly, so having an extra battery on hand for it is a must. Since, I’ve already seen the Mophie Juice Pack Pro in action, I was curious to see how well the iBattz Mojo Armor battery case would hold up. 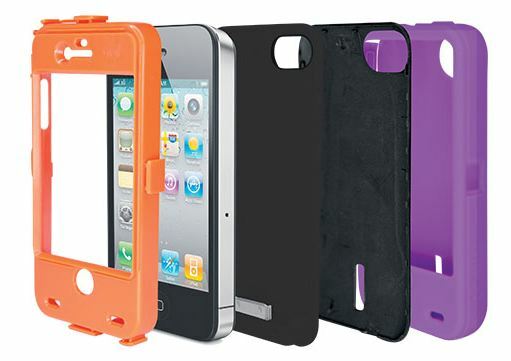 According to iBattz website, the iBattz Armor Battery Case will provide the iPhone 4 with up to 80% extra battery power and 70% extra battery power for the iPhone 4s. With the use of “fast charge” technology, the iBattz will recharge your iPhone in around 90 minutes. When the case arrived, the packaging was simple and easy to understand. Compared to my Mophie case, this one was much slimmer and lighter. At first glance, a co-worker thought it was an Otterbox (they look freakishly similar). My iPhone was at a healthy 80%, so I turned on all the bells and whistles to drain it down to the recommended 20% level. Once my battery hit 20%, I pushed the button on the side of the case and activated the battery. Then, I turned off some of the features I had activated earlier (wifi, location services, bluetooth). I started the battery at 3:58pm. My iPhone had a 22% charge and the battery in the case had a full charge. At 4:48pm, my iPhone had a 75% charge. The battery on the case finally died when my iPhone reached 90% at 5:20pm. Total turn around time was 82 minutes. Not to bad for a first run, so I took out the battery and charged it over night. The next day, I let my battery go back to the 20% charge, but this time, I continued to use my phone heavily while it charged. This time, the case took almost two hours to get my phone to a 90% charge. In both tests, the battery charged my iPhone pretty quickly, but after it was done, the backup battery was dead and I was lugging it around for nothing. It also never got my iPhone up to a 100% charge. One of the things I really like about this case is that the batteries are the same as the Samsung Galaxy S2. This makes getting replacement batteries as easy as driving up to the nearest Samsung Galaxy retailer or visiting Amazon. I’ve used this brand before with another phone I owned and it was well worth the investment. So, if you want a slimmer case and you don’t care about carrying a spare battery with you, then this case would work for you. I know one of the biggest complaints with the Mophie Juice Pack Pro is that it’s bulky and the clip isn’t the greatest (this one doesn’t come with a clip at all). Personally, I’m happy with my Mophie Juice Pack Pro case, since it will provide me with twice as much extra battery power as the iBattz Mojo Armor battery case. The iBattz Mojo Armor Removable Battery Case is available on Amazon or through the iBattz website for just under $100.